The Attic Archive in Dundee, Scotland was born when Pete Horobin began to document his creative activities and lifestyle after graduating from art college with a diploma in drawing and painting in 1975. The first projects to be documented and archived were The Accessibility of The Art Object – 1976 to 1979 – and Junk Into Art/Art Into Junk – 1979. The former distributed hundreds of original collage drawings locally through the post to random addresses chosen from the telephone directory as well as through commercial channels such as galleries. Originals were marketed very inexpensively so that they could be purchased by anyone. For example collage drawings were made into button badges to sell for 50 pence each. This was the first attempt in Scotland to challenge the elitism of the art market and make an art product totally accessible. The latter project invited artists associated with The Dundee Group (Artists) Ltd and Cairn, an artists collective in Paris, to work with industrial waste materials in Dundee. The whole project was rigorously documented from the collecting through to the experimental construction of temporary artworks to the breaking down and scrapping of the installed pieces. The documentation, which was exhibited in Cairn, is all that survives of this event. This method of working impermanently and collaboratively along side a conscious reflection on recycling waste had not been tried and achieved in Scotland before. These two projects – one deploying the post as a vehicle for the distribution of small artworks and the other using photo documentation and set perameters in time encouraged Horobin to consider documenting his life and creativity over a sustained period. On 01.01.1980 Horobin commenced a ten-year project called DATA – Daily Action Time Archive – the core activity of which was the daily action of stenciling the date. At the end of each month Horobin collated his documentation and stenciled DATA sheets and photo copied the originals making loose leaf A4 publications which were sent through the mail to friends and associates living in the UK and Paris. Cairn added Horobin to their mailing list with the consequence that by the end of 1980 artists working in the mail art network had made contact and were inviting Horobin to participate in their projects. 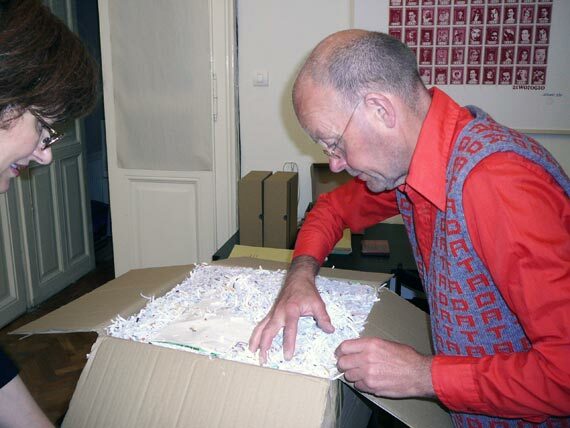 Peter Below (Würzburg, Germany), Robin Crozier (Sunderland, England), Vittore Baroni (Forte Dei Marmi, Italy), and Eric Finlay (London, England) were the first to make contact and these collaborations rapidly developed into Horobins commitment to the mail art / correspondence art network and Neoism. This development was very exciting for Horobin as an artist because he had taken an instinctive leap into a new arena with the intention of escaping from the limitations of commercialised promotion within the Scottish gallery system. He was seeking a dialogue with his audience and mail art not only provided this but also stimulated collaborations. The concept and intent of DATA was to archive everything that related to the process of living and creating from ephemera to his photo documentation of art actions and daily rituals, such as cutting nails and shaving, to the mail art that arrived through the letterbox each day. Nothing was discarded and everything was given equal status, that is to say, a piece of ephemera was as important as a finished artwork. This ten-year process which stopped on 31.12.1989 resulted in an extremely detailed self-portrait of an artist living and working in a very particular environment in the latter stages of the 20th century. 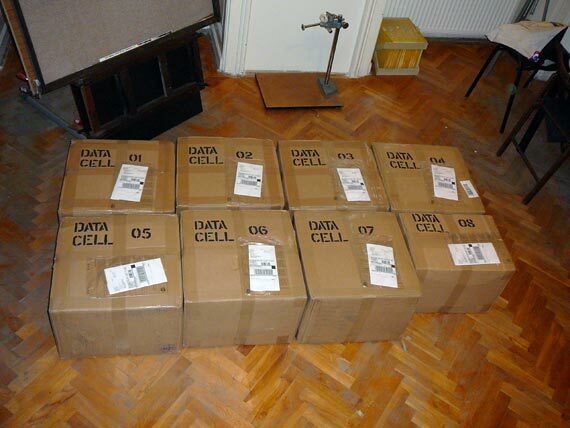 The mass and weight of DATA, a result of its obsessive thoroughness, mitigated against it when the time came to relocate it from The Attic Archive to somewhere more permanent because no single organisation was prepared to accept it in its entirety. At the time of writing three organisations have agreed to house parts of DATA – the McManus Galleries and Museum in Dundee (ephemera and material connected to Dundee), the Scottish National Gallery of Modern Art in Edinburgh (DATA sheets for 1980, 1986, 1987, 1988, 1989 and the Acrobat project of 1982), Artpool (all the international mail art / correspondence art along with associated collaborative projects and publications including the original documentation of the 8th and 9th Neoist Apartment Festivals held in London and Ponte Nossa respectively plus DATA sheets, bookworks, audio cassettes, VHS cassettes, photographs and postcards by Pete Horobin). Artpool therefore houses the bulk of Pete Horobin's DATA project, however, this represents only one third of the material held in The Attic Archive. Two more life/art projects – the journals of Marshall Anderson and HIBERNIA – Hainings Irish Biketour Round Eire and N Ireland (Arts) - by Peter Haining – are also archived and awaiting relocation. As yet the Marshall Anderson project, which is rooted firmly in Scotland, has not been resolved while it is likely that HIBERNIA will be contained within the National Irish Visual Arts Library (NIVAL) in Dublin. There is also such a box made from recycled cardboard for a large collection of Smile magazines, some of which are one-off handmade editions. It is virtually impossible to calculate how many different Smiles were produced between 1984, the year of the first edition, and 1990, the year of the V and A commemorative exhibition, or to presume that any one person has a definitive collection because legions of Smiles were made and distributed below the mail art radar. The administrator travelled to Budapest with all his clothes and various pieces of equipment packed in a small gold suitcase which, after arrival, was emptied and retouched with gold paint at Artpool. It was then filled with a collection of Neoist objects including the original gold chapatti made in London in 1984, rubberstamps by Horobin and Michael Leigh, a T-shirt by Istvan Kantor/Monty Cantsin, monogrammed matches commemorating the first meeting of Horobin and Crozier in Newcastle in 1981, and a gold crocodile which survived the rigors of the Berlin Apartment Festival. Also included in the material from The Attic Archive are three small black wooden DATA CELLs containing items from Horobins life – the first, tooth brushes used during 1989 – The Year of the Tent; the second, razors used during the same year when Horobin lived outside maintaining his correspondence art practice from a tent while travelling around Scotland on foot; and the third, all the nail clippings collected over the course of the ten-year DATA project. 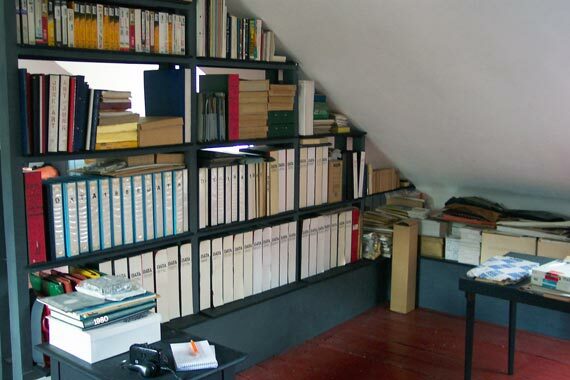 The relocation of material from The Attic Archive and its installation in Artpool has prompted the refiling of particular pieces from correspondents such as Istvan Kantor, John Berndt, Michael Leigh, and Snowhite Jung who have now been allocated their own boxes and/or files. Mail art / correspondence art is now filed according to its country of origin whereas in The Attic Archive it was all filed chronologically. The Artpool archivists will, over the course of the ensuing months, assimilate this material into their own catalogue system and through this process its true worth and inter-relating narratives will become obvious. The highly textured two-dimensional works on paper are supplemented by audio cassettes and VHS cassettes made either by Horobin or received through the post from various correspondents. DJ at Fomt, for example, was primarily an audio artist with a musical bias who produced a rich catalogue of limited edition cassettes. Rod Summers too is well represented with his own brand of VEC audio from the 1980s to 2010. There is also a unique collection of highly personalised audio letters from Jack Saunders to Horobin. The majority of VHS cassettes are of interviews with those who visited the DATA Attic between 1985 and 1988 and include Stewart Home, Kate and Alex Hirka, Peter Küstermann, Stefan Szczelkun, Graham Harwood, Andrzej Dudek-Dürer, and tentatively, a convenience. It is Artpool's intention to digitalise this media and once again its value will become obvious through the process of assimilation and accessibility. It was always the ambition and purpose of The Attic Archive to resist becoming a dead-ended resource or a cultural cul de sac in which the material preserved atrophies. One way to prevent this occurring is to ensure that the material in the archive is available for the making of new works. 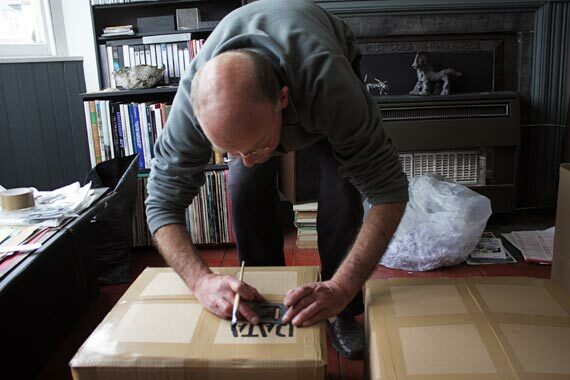 For example, when Peter Haining returned to Dundee from Ireland in 2005 he assumed curatorial responsibility of The Attic Archive and set about producing a series of 40 video works based on the contents of the archive. The ensuing dvds were installed in the Cooper Gallery at Dundee University during March and April 2010 under the title, Moving Images From The Attic Archive. It is hoped that Artpool will actively encourage and stimulate the making of new works from the relocated material - hence the title From A to A - New Directions. I will take this opportunity to thank the Galántais and Artpool for the vision and faith they have exhibited throughout this process of relocation. I am certain there will be many critical of the fact that a Scottish project has found a home in Hungary but truly international art knows no political and cultural borders. It is irrelevant where an archive such as Artpool is located because those researchers and people with a special interest in the development of creativity will travel anywhere to discover for themselves the inter-connecting narratives and social networks which conjoin to tell the true history of art as it was practiced during the final stages of the 20th century and into the first years of the next millennium. And although we cannot gainsay nor guess what the political future of Europe holds we must believe that the freedom to travel without borders persists.